I don’t post much in the way of personal things on this site, but I wanted to recognize the milestone, one year anniversary of my first post. Things are very hectic in my world lately so I didn’t manage to post on the actual anniversary of May 17th but since so many lovely and exciting things emerged in the past year, thanks to this blog, I’m forging ahead with a belated anniversary post. And it starts with thanking those of you who take the time to visit the site, read it, share it, and comment. Your participation and presence makes all the difference in the world. This all started as a way for me to learn more about Sweden and share that information along with my love of food, culture and photography. It has turned out to be an incredibly enriching experience and I haven’t looked at, or thought about things the same way since that first post. Here are some quick highlights from this past year. The Princess cake demystified post was stumbledupon and has received nearly 115,000 views. Amazing! The Spettkaka (spit cake) post was featured on WordPress’ freshly pressed. That was a real treat. Because of this blog, I was asked to contribute several articles as a featured writer on food for Sweden’s online news in English, The Local. It was fun to do even though there are some really cranky people leaving comments on that site (yikes!). And thanks to the articles in The Local, I was invited to participate in a promotional video for Irish Lamb by Board Bia. Despite the fact I said “okay” about a million times during the shoot, it was a pleasure to work with Michelin starred chef Liam Ginnane and have the opportunity to taste his amazing recipes for lamb meatballs, lamb Rydberg, and Leg of Lamb. My thanks go to Philip O’Connor for bringing me on board for that project. I’m hungry just thinking about it. I was nominated for the Versatile Blogger Award by Sue at Swimming in the Mud and also by Mira Goes to Market. Thank you ladies. I’m so flattered and I still have aspirations of fulfilling the requests that come along with the award. And Sue at Swimming in the Mud was kind enough to nominate me for the Beautiful Blogger Award as well. Thank you for being such a supportive follower Sue. It means a lot. Finally, this blog served as an extension to my resume and played a role in my recently landing a great job here in Sweden. It was a long search that I think will prove to be worth the wait. 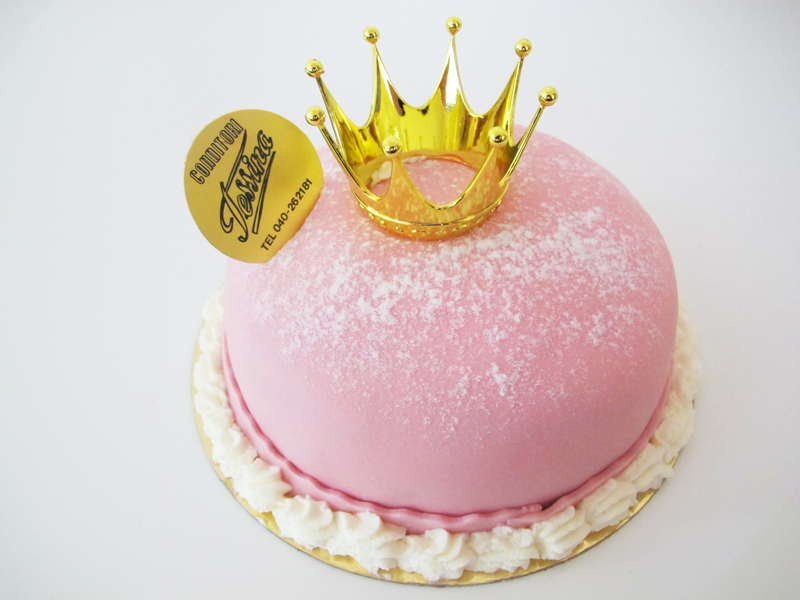 I bought this special edition princess cake (pictured above) to celebrate the baptism of our new little Swedish Princess Estelle which took place on May 22nd as well as to celebrate the one year anniversary of this site. I’m excited to see what the next year will bring, what I will learn, and who I will meet and continue to get to know because of this blog. My thanks again to you for sharing this experience. I hope you continue to enjoy the site as much as I enjoy working on it. Here’s to you and another great year ahead. Skål! Sounds like you’ve had a really incredible year – congratulations. It’s a shame you couldn’t post on the actual anniversary, but it’s great to see a post to celebrate it nevertheless – you have a great blog. Oh no! Do you prefer Susan over Sue? I can change that post. Being a person who has spent my entire life trying to get people to pronounce my name correctly, I’m kinda sensitive to getting this stuff right. Congrats on your 1-year anniversary! I love your blog and love reading about all things Swedish. Bravo! Thank you Jody. I really appreciate your continuous interactions and support. I’m so glad you are enjoying the site. My son lives in Sweden so I’m always interested in all things Swedish! Cheers! Maia, Congratulations–on you blog and on your job! How exciting. I love feeling connected with Sweden through your posts and look forward to each new entry. We’ll be on Swedish soil in 20 days! Thank you Karen. The new job is a little overwhelming after only 3 weeks there, but I think it will be a really great experience. The countdown for your trip to Sweden is on! Safe travels. Congratulations on your blogversary! I have been in love with Sweden for what seems like forever now but until I get there, I love learning about it through your blog. Seems like you have come a long way from where you began. I wish you the best and congratulations again! Thank you so much. This last year has really been quite an experience. I always wish I could post more often than I do, but I’m happy to have been continuously posting for a year and for having some wonderful opportunities thanks to this blog. Thank you so much for taking the time to comment. I’m so glad you are enjoying the site. Congrats Maia! It is so fun the see your posts. They are so well done and I wish I could be there to see you and all your gorgeous treat and eats! Good luck with the new job! Thanks Joanna. It’s fun that you are following them! I wish you could be here too. 🙂 Hope all is well with you and yours. A belated Happy Anniversary to you too. I’ve really enjoyed reading your blog. Have several recipes I still want to try out and I’m sure more to come. The photography is beautiful, the text informative and pleasant to read. (Really nice because I’ve seen some blogs you that are so poorly written you can’t get through the first few lines.) Congratulations! Good job!